Load cell manufacturer Straightpoint (SP) has teamed up with measurement equipment specialist Tarka-Systems B.V. to add to its extensive range a product that can be left at a jobsite for a period of time and capture data from up to six monitoring devices. The Multi Operation Survey System (MOSS) features six, 4-20 milliamp (mA) inputs that collect information when multiple types of data are required, captured by load cells, thermometers, anemometers and other technologies. The MOSS, boasting USB data storage capability, is typically applied where data needs to be gathered over a period of time, say, when conditions are likely or known to change. 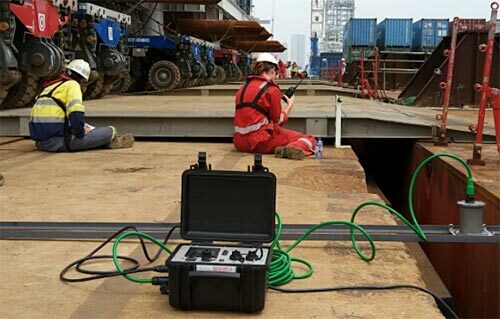 Originally designed for the marine industry, where wind speed and sea state might be among variables, the product is provided in an IP67-rated, portable case, mounted on which are the connectors (also IP67 rated) that can be used while the case is closed, offering protection from the elements – even snow and ice. The MOSS has also been successful in construction and infrastructure applications where other demands are placed upon it. The MOSS’s case provides readout, presentation and storage of multiple sensor signals and houses the system’s key components, including screen with user control buttons and battery supply with status display. The battery lasts for up to 24 hours but an additional power pack extends this to up to five days for applications where monitoring is required over longer time periods. Henry Wijgerse, owner of Tarka-Systems B.V., explained that the product was to some extent conceptualised during his time at Maritime Research Institute Netherlands (MARIN), which is principally engaged in nautical research. “Since we’ve introduced Mike Neal [product sales engineer] and Marcus MacDonald [machine shop supervisor] to the company, we’ve generated an increasing number of enquiries for custom products with autonomous logging, but it might not be practical to leave a laptop, for example, exposed to the elements. The MOSS fills that gap in our offering,” Ayling concludes. Tags: Straightpoint (SP), Tarka-Systems B.V.